And they work in pivot but %LISTING says that it doesn't know them. 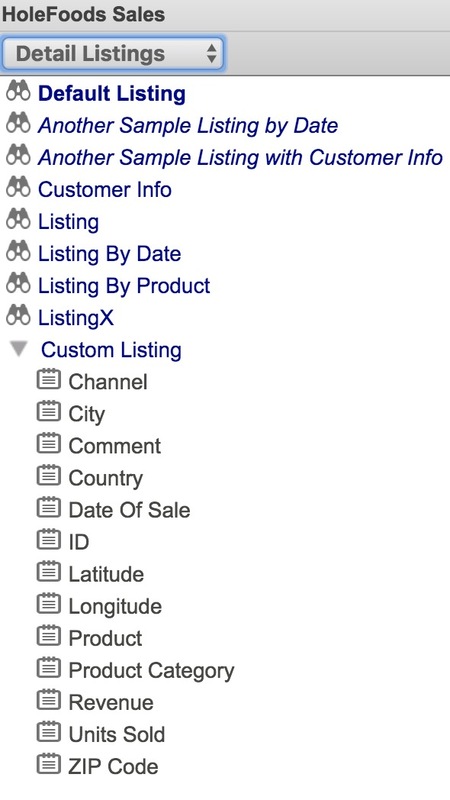 "Custom Listing" is the listing that you construct in pivots using Listing Fields, see here: Display a Detail Listing. I have not checked the code but to me it makes sense that, if defined on the pivot, "Custom Listing" will not be available for general MDX queries. Thank you, Alessandro! That's clear now. I guess Custom Listing is being executed with DRILLTHROUGH + field names by comma: there is an option in Drillthrough documentation. Yes, %LISTING this works perfectly with listings declared in the cube definition. But if you open Analyzer you can see extra "Custom" listings, which are available in the pivot, but not available via %LISTING. Oops. I just looked for MDX. DRILLTHROUGH SELECT FROM [HOLEFOODS] RETURN Outlet->City "City",Comment "Comment"
The question was that everything which is listed in pivot-settings-dropdown is available to call with %LISTING in MDX, except with "custom listing". MDX instruction, as you wrote. Thanks! What is exactly that custom listing? Is it defined in Listing Group (those ones should work using %LISTING)? Just figured out, that there are some extra listings (in addition to those we have in the cube) available for pivots in Analyzer. %Listing only works (for me) with those which are declared in the cube. You can see (and alter custom listing) if you open Detail Listings section in Analyzer (version 2017.2).